One of the last races of the 2017 Ironman calendar, Ironman Cozumel, took place on Sunday. 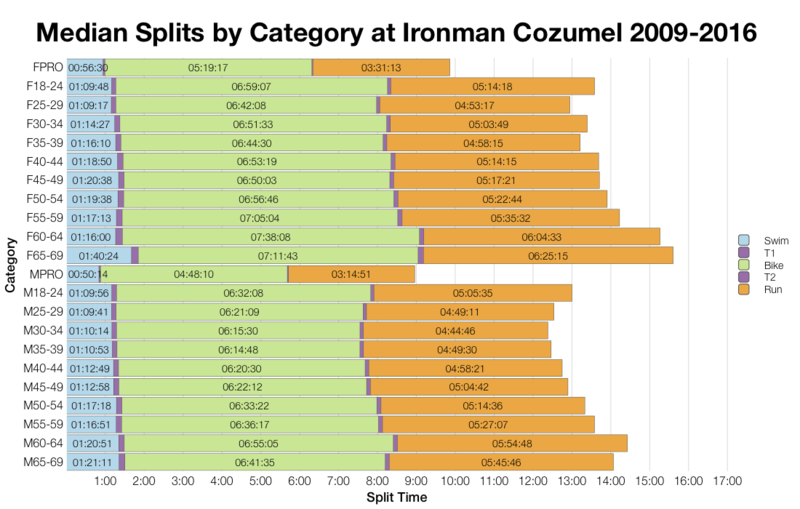 Cozumel is a medium sized race with around 1500 competitors for the standard 40 Kona slots. This year’s race looks to have been one of the quicker years for the event. 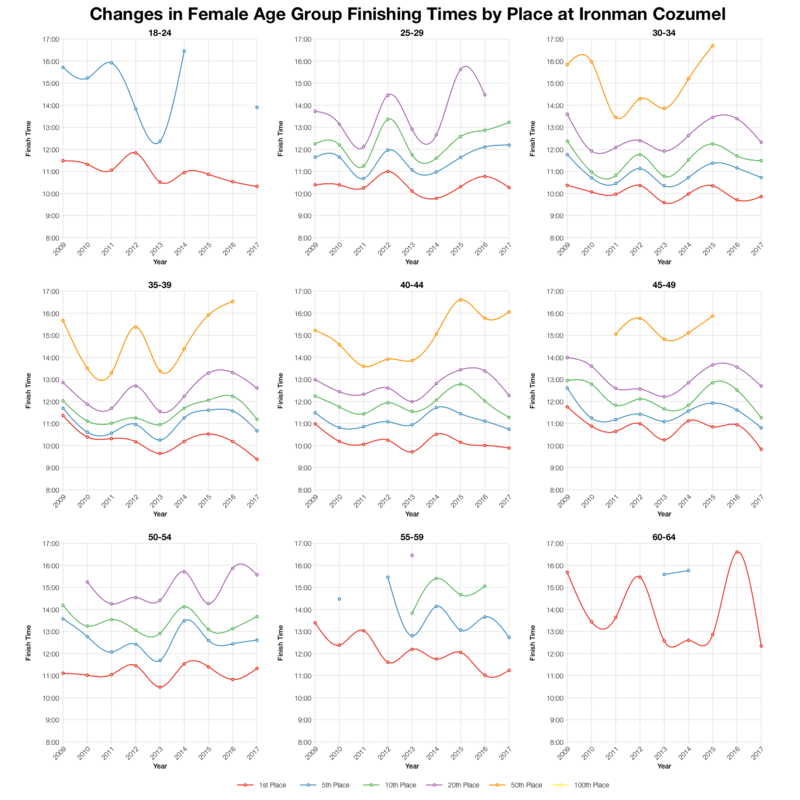 The shift in the swim distribution at this year’s race is probably the most obvious difference in these charts. 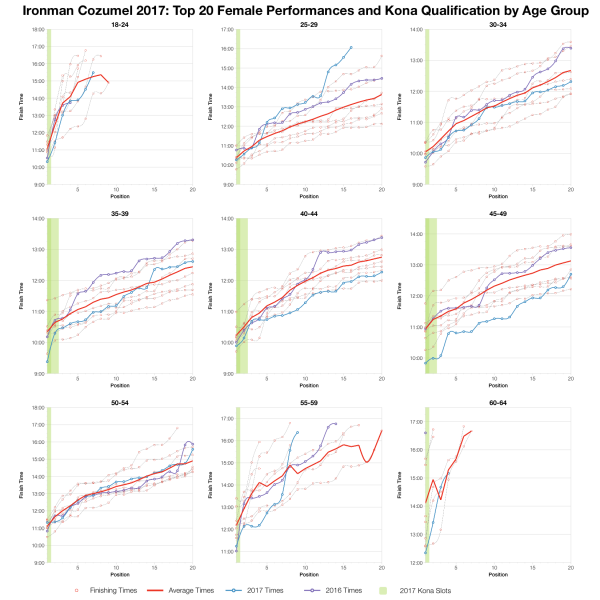 The 2017 swim was much faster than usual and much faster than most Ironman races with almost 50% of the field taking less than an hour. I’d assume there were currents or course alterations involved here. 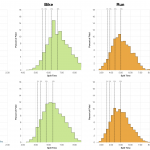 The swim alone isn’t enough to make for a fast race and this year’s bike also trended faster and ensured the overall distribution came in ahead of the amalgamated data. 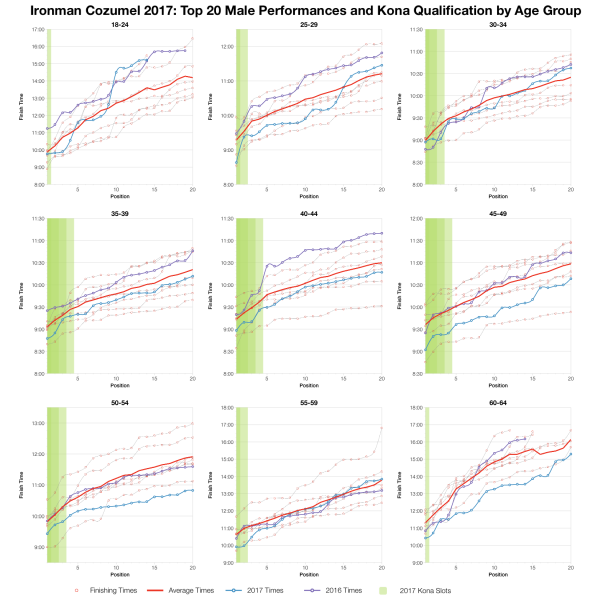 As mentioned above, the data that’s been uploaded to Ironman.com only indicates those who successfully finished. I’ve presented previous DNF stats for some form of reference. Looking at sportstats.ca results DNF levels appear to have been low throughout. As with the distribution, this year’s medians trend a lot faster in the swim and faster in the bike. 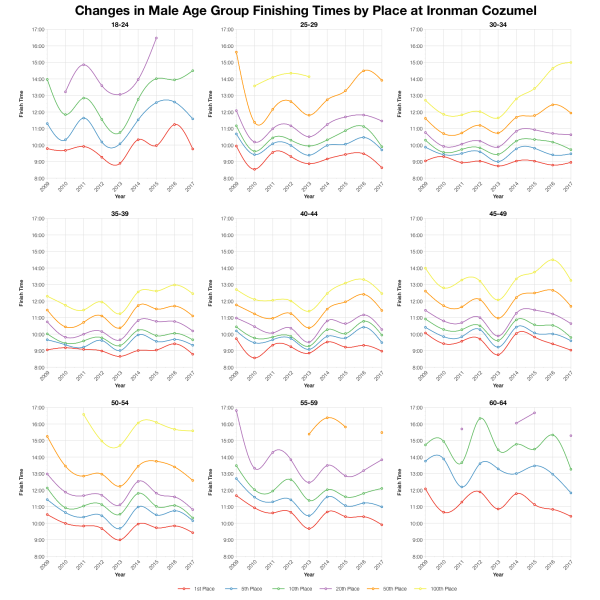 While the run trends slightly slower for some age groups the combined result is a faster race across most divisions. Cozumel draws a diverse field of athletes from round the world and also looks to distribute the Kona slots widely. 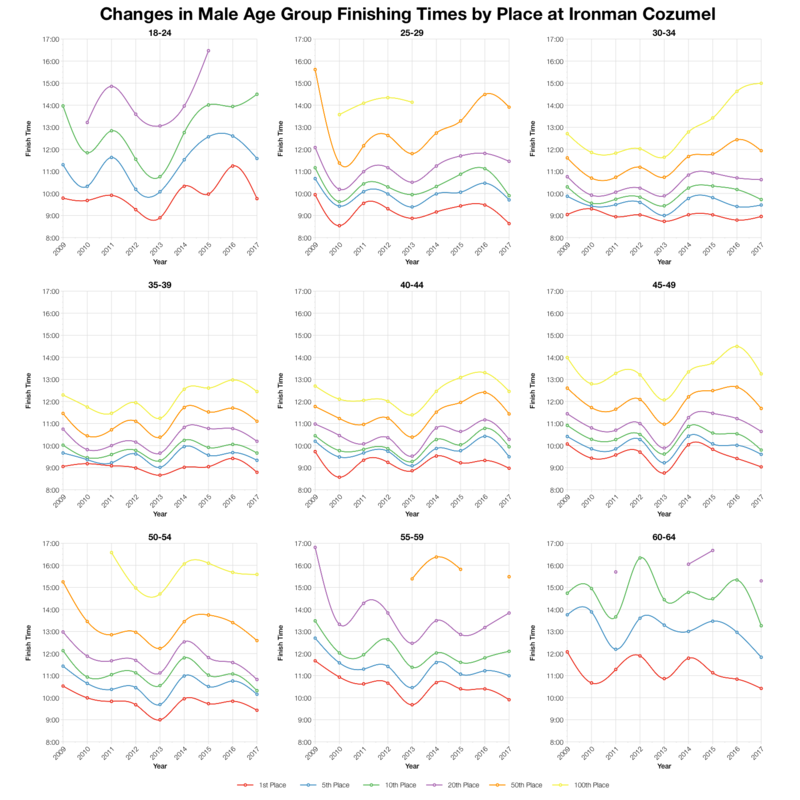 There is a definite improvement in times at this year’s race compared with previous years. 2010 looks to be the best comparison for most of the age groups. this puts the 2017 race as one of the fastest. 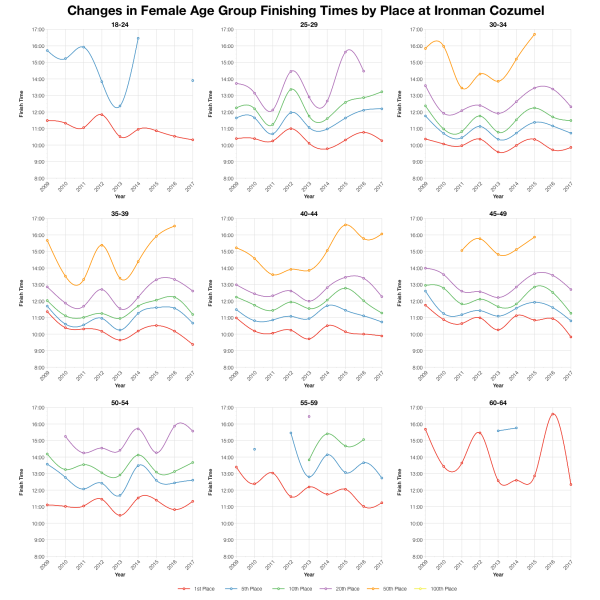 It’s not true for every age group and moving back in the field sees smaller improvements in time. Based on the start numbers at the race, I’ve estimated the slot allocations, exact numbers may vary especially as DNS details aren’t accurate for this event. From this I’ve calculated the automatic qualifying times without accounting for roll down. You can compare this with other races on my Kona qualification page. 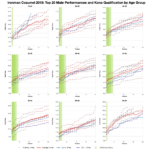 With some variations, times for the top twenty in each age group are average or faster. While this race appears to trend faster, it’s not consistent at the front and it’s not always that much faster. 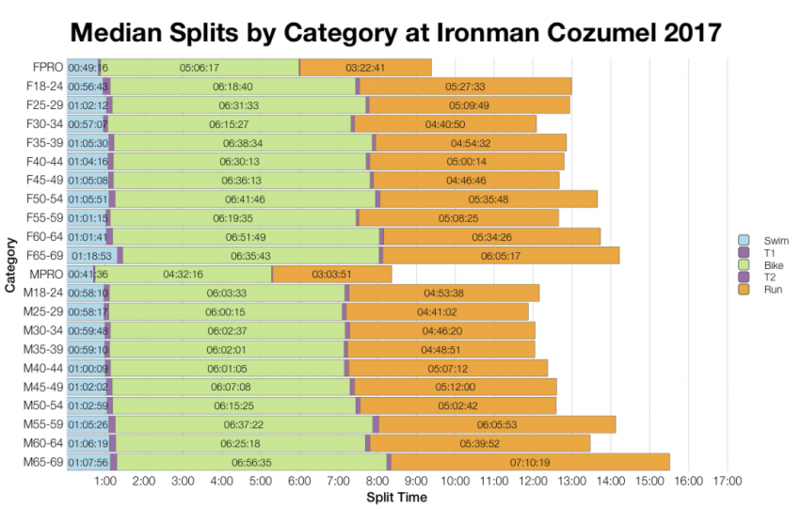 You can access a spreadsheet of the results from Ironman Cozumel 2017 on my Google Drive.